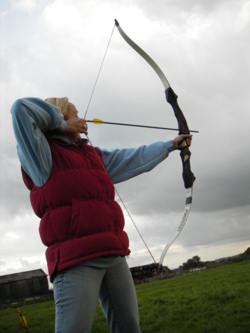 Adventure21 - Archery risk assessment Risk assessment in the Lake District, Manchester and Lancashire uk. Hazards arising from risk - tripping and falling, puncture wounds from arrows either whilst retrieving from targets or from release from bow. Friction burns form strings. Effects of hazard - Puncture wounds, loss of sights, cuts, bruises, friction burns and broken bones leading in severe cases to death. Risk management - pre session instruction from qualified / experienced person, danger areas marked out, signed and pointed out to group, check of equipment and safety equipment worn throughout the session. Constant vigilance by instructor with regard to the shooting perimeter, viewing area and general public. Use of archery curtain where necessary.